This is a very nice looking set top box; possibly the most attractive design I’ve seen, with lots of glossy, high-quality plastic. The bottom of the unit even has a nice textured pattern on it. It’s unexpectedly heavy. This is not a thin sheet metal enclosure with a tiny circuit board inside. It feels solid, dense, and well constructed. It passed my easy of installation test: I didn’t need to consult the install manual. Plug in the Ethernet cable; plug in the HDMI cable; plug in the power cable; done. The RF remote does not require line-of-sight to the unit; I put it in the closet (located behind the wall on which my TV hangs) and closed the door. The RF remote fits well in your hand and has an Apple-like simplicity about it: 1 scroll wheel and 5 buttons. In use though, I found it slightly confusing because it only scrolls up and down, but much of the on-screen user interface is left-to-right. I soon figured out that if you keep scrolling down with the remote wheel, the on-screen selector moves all the way to the right and then jumps down to left side of the next row. The user interface looks very nice and modern and features movie cover art for top movies on pretty much every screen. It looks much better than TiVo and even better than Windows Media Center. However, the menu structure and groupings will take some getting used to. I need a faster internet connection. I was surprised that I had to wait 30 minutes before I could watch the 1-hour documentary March of the Penguins in HD. My 2 mbps Comcast cable connection speed is lower than the recommended 4 mbps required for instant viewing of HD. I really need a faster internet connection. HDX (near Blu-ray quality) movies take several hours to download. I didn’t see an exact time estimate, but it’s looking like 6+ hours per movie. I was initially disappointed by the high cost of the hardware, especially the XL version, but Vudu just announced massive price cuts. 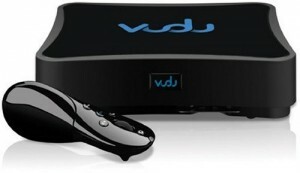 $150 is the new price of the basic Vudu box (down from $299), $499 is the new price of the XL version (down from $999) and it now includes the previously optional $100 home theater connectivity software package. Great writeup, I look forward to the full review(s) as you have planned. The difference between VUDU and MCE? VUDU has all new release content and in 1080p. MCE has Hulu! There is no comparison. My family loves our VUDU boxes. Oh and Netflix? Well if you like watching old rerun TV shows at VHS tape quality, you will love it… We hated it. Keep up the good work. For internet content my current setup has PS3 (w/ Playon for Netflix InstantPlay) and AppleTV w/ Boxee. I’m curious to see your review of VUDU.